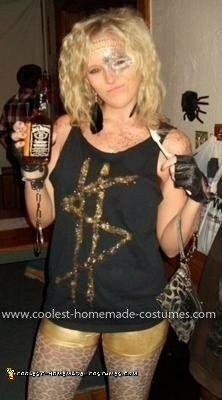 This is my homemade Ke$ha costume. I based the costume off of her music video “Tik Tok” especially the lyrics, “Wake up in the morning feelin like P-Diddy, grab my glasses I’m out the door I’m gonna hit the city before I leave, brush my teeth with a bottle of Jack, cause when I leave for the night I ain’t comin back” So I had my baby bottle of Jack and a tooth brush. In the video, Ke$ha also gets arrested so I wore handcuffs. To make the actually outfit part, I bought a plain black t-shirt and cut the sleeves and neck to make it into a bro tank. Then using Elmer’s clear glue and SO MUCH GLITTER I made her signature money sign. I then used that same glue and applied it all over my arms and chest and sprinkled glitter onto me. Since it was clear glue it didn’t show, but by the end of the night it was peeling off. I did the same for my face but just did it more concentrated with silver glitter. The gold spandex shorts were from a dance costume I had when I was in elementary school that somehow still fit and I just wore my cheetah tights underneath. For my hair, we just used a three barrel curler and teased it like crazy and added more glitter. The key to this costume was glitter and clear glue.